Now is the time to check discount stores for super Christmas markdowns you can give all year long. This Dollar General even had ornaments made by pricey brand Fitz and Floyd. This year I vowed to use what decorations I already have, rather than buying more to store. 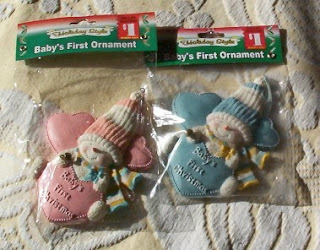 But I did pick up a few gift "Baby's First Christmas" ornaments for 25 cents apiece. You can't tell from the photo, but these are particularly well-detailed. These were great for the gift closet because (a)they're not dated, and (b) they don't take up space. But you don't want to give these ornaments "as is". Take it out of the cheapo packaging, use a paint pen to write the birthdate somewhere, then rewrap nicely in tissue paper. Include it with something the new mom needs--my standard: diapers--and you have a gift that's both practical and sentimental. Sometimes I include a cute baby outfit with the tags still on. I find those all the time at yard sales and thrift stores and stockpile them for under $2. Meredith - This is a sweet baby shower idea and since I have several to attend in the next few month, I'm headed out to our Dollar General to see if I can stock up! Thanks! Christmas deeply discounted decor makes great bridal shower gifts, too. Buy some lights and simple glass balls and tinsel, package prettily in a storage bin or basket...throw in a thrifted book on decorating or recipes for the holidays. voila! Under $5.00 gift that makes setting up the first Christmas a little easier on the budget. I do the same thing- removing all DG packaging on gifts! :P I really enjoy my local DG; they have great products.